For a quarter-century, we have allowed the Simpsons family and all of Springfield into our homes for 25 minutes of entertainment every week. 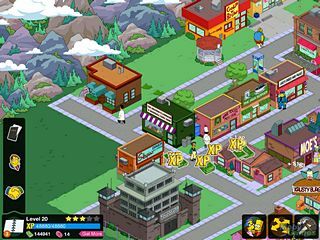 This game is perfect for Simpsons fans who love simulation games! As you build things, more characters from the show come out and you get to put them to work as well to gain rewards. Springfield has been blown up leaving nothing but garbage and toxic waste and it is up to Homer to rebuild civilization. Collect money, donuts, friend points, and experience points as you clean, rebuild, and reunite the city and population of Springfield. The city looks just like the cartoon. The Simpson’s house (you have to put up a new hammock), Apu’s Kwik-E-Mart, Flanders' house next door… it’s all in there! The first order of business is to rebuild Homer’s house. Once the house is built, Lisa comes out and you can put her to work. For the Simpsons franchise to put their names on this, you know that the graphics have to be of high standard. I assure you, they do not disappoint. They’ve got the same cartoon feel in the game play as there is in the show itself. There are some voices that are dead-on. 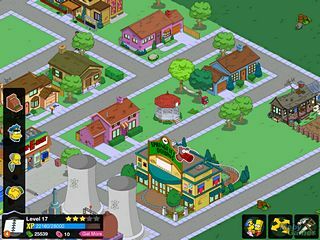 If you are a Simpsons fan, then I full-heartedly recommend this game for your device! This is The Simpsons: Tapped Out review. Download this game here.